March | 2006 | "Self-plagiarism is style"
…which of course means we’ll get a cool new name for it all next year! I’ve just arrived at the Crowne Plaza NEC Birmingham, ready for a meeting with Paul Miller at Talis first thing tomorrow morning, followed by the SirsiDynix Executive Roadshow 2006. Travelling to Birmingham is never straightforward — today, due to a broken down train, they had to cram two sets of passengers onto a single train. 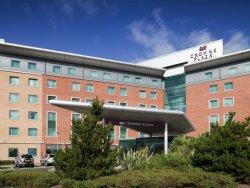 The Crowne Plaza is officially located in the middle of nowhere, about a mile from the National Exhibition Centre. Just in case there’s anyone reading this who’s planning to arrive tomorrow via train — get off at Birmingham International, walk straight through the NEC (you’ll see the occasional sign for the Plaza), and when you exit the NEC by the bus stops, you’ll be able to see the Plaza in the distance. The entrance to the hotel is actually on the other side, so you’ll need to skirt around the edge of the building. …and what is it with hotels and light switches? I seem to remember it took Bryony and me about 10 minutes to figure out how to switch the lights on in our hotel room at CODI 2005, and it took me even longer today. When I walked into the room, none of the light switches would work. So, I read the guest information booklet twice (standing by the window as the light of the day faded), but there were no tips in there. Hmmmmm – should I swallow my pride and ring up the reception desk? …not much help there, although Google Images has an amusing picture that seems to be someone gaffa taped to a wall. Sadly, I couldn’t get the full sized version (http://www.pocsmadar.hu/miazmas/tesa.jpg) to load. Anyway, on closer inspection, the box has a credit card sized slot in it… (gears begin to grind)… and my room door key is shaped like a credit card… eureka! Inspired by Lorcan Dempsey’s post about Coins in Open WorldCat, I’ve been messing around with adding Coins to our OPAC. Obviously there’s little point linking from our OPAC to our own OpenURL resolver — the idea is more that you can configure the exension to point to your preferred resolver. Although having links to “people who borrowed this” is cool, it does tend to link to items that circulate well (which you could argue is a “good thing”). On the other hand, the quick links to items with same/similar subject headings are deliberately shown in a random order. I’ve spent the afternoon Ajax-ing the “did you mean?” code on the OPAC, and also finishing off the serendipity suggestions. Obviously the suggestion of searching for “Close Faraday” is of little use. However, most of the serendipity suggestions are relevant to the film, and at least two of them will lead me straight through to the catalogue page for “Der Himmel Ã¼ber Berlin” (the prequel to “Faraway, So Close”). One rather cool outcome of this is that our OPAC can now sometimes answer questions! Sadly the results don’t always lead to relevant items, but at least our OPAC knows the answer to the Ultimate Question! As mentioned in this post, I’ve rejigged our HIP server so that it has an Apache instance running in front of it that’s acting as a reverse proxy.